Written by Bonita Hutcheson and edited by Thea Hutcheson in 2012. John McBroom was Wagon Master when te came to survey the area of the Platte River, south of Cherry Creek. He liked the area near Montana Creek (now Bear Creek) and the South Platte River. In 1858 Peter Magnes and wife Bertha had arrived. They purchased 160 acres and built a log cabin on it. Their cabin was south of Little Dry Creek and east of the South Platte River. Like many men of thatera, Peter had many skills including veterinary knowledge, farming, and a shrewd sense of business. His daughter, Lena, was thought to have been the first white child born in the area. She was born in a covered wagon near what was to become Denver. Once settlements came roads were next. On December 7, 1859, a toll road was authorized by the General Assembly of Jefferson Territory, fees were also approved: "for each wagon, two horse, mules or oxen, twenty-five cents; every horse, with or without a rider, ten cents; for every head of cattle, five cents; Footman [sic] free." Crossing the Platte was a major event. In the spring and early summer it could be a raging torrent, but in the fall, the pioneers said it was an inch deep and a mile wide. A toll road was developed by the Denver, Auraria, and South Park Wagon Road Company, and called the Bradford Toll Road. It ran from Denver-Auraria along the east side of the Platte across Brown's Bridge over the Platte at about present day Union Avenue, through the town of Bradford (Ken Caryl Ranch area) to South Park to the Arkansas Mines. It became the route of one of the earliest stage coach routes to South Park. The first train was The Denver & Rio Grande narrow gauge; it ran from Denver to Colorado Springs was completed on October 21, 1871. It was the fifth railroad completed in Colorado and ran along the west side of the Platte River. The easy access to this land south of Denver made settlement and development more attractive. On June 18, 1874, the Denver, South Park, and Pacific narrow gauge between Denver and Morrison, via Bear Creek Junction [later Sheridan Junction] was completed marking the opening of a new route to South Park and making the future town of Sheridan possible by creating a stop that would be important as a junction for all the surrounding communities and [later] Fort Logan. This railroad was started by John Evans and we understand that there is a plaque to the northwest of the stone house south of Yale off of Estes. One branch of the train went west to Morrison from the Junction, the other continued to the south. Sheridan Junction was situated at the end of Zuni Street, where it meets South Brady Court, near what would be Ithica Place, south of Sheridan Avenue or County Road 14 (now U. S. 285). Transportation brings people. Petersburg became a stopping place for wagons because it was perfectly situated just off the Bradford Toll road. 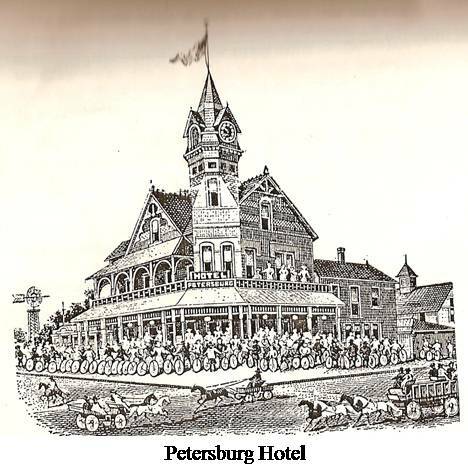 In 1879 The Petersburg Hotel was built near the corner of what is now (Old) Hampden and Santa Fe. The hotel served as a focal point of community activities, boasting eight blacksmiths, fourteen saloons, one newspaper, and three stores in the immediate vicinity. The Atcheson, Topeka and Santa Fe Railroad was built north to Denver in May 1882. Peter Magnes donated the land for the new rail line. In 1873 he filed the first plat in the area for a settlement called Petersburg. Main Street in Petersburg then became Santa Fe Drive, named for the railroad. 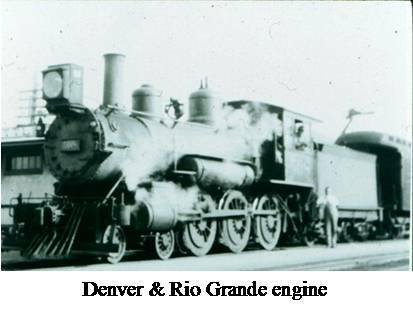 A third standard rail was laid by Denver & Rio Grande along the Atcheson, Topeka, and Santa Fe lines. Citizens of Denver and surrounding communities made several requests of the Army to establish a military post in the area for their protection during the early years of Denver. In 1883 General Sherman and his successor, General Phil Sheridan, agreed that the exigencies of travel necessitating a string of "small posts along wagon and stage routes of travel" had been rendered unnecessary by the advent of the railroad. It was recommended that forts be located near cities. In May 1886 Senator Teller introduced a bill to authorize a post and appropriated $250,000.00 to build it. The bill was signed by President Grover Cleveland on February 17, 1887. General Sheridan arrived in the Denver area on March 20, 1887, and reviewed eleven sites in four days. He chose the area known as the "Johnson Tract", about eight miles south of the city of Denver because of its water supply, the proximity of the Morrison branch of the Denver, South Park, and Pacific railroad, available space for a parade ground, artesian well possibilities, the beautiful view and the distance from Denver and its saloons. The first soldiers arrived in a snowstorm on October 22, 1887, and camped some distance to the north of the fort grounds, having missed the site because of the snow. On May 16th, 1887, Isaac McBroom filed a subdivision plat on the south west corner of his property [which abutted the fort grounds]. This was just the corner, the south and west sides divided the area into three blocks to the north, bounded by the lines of the Denver, South Park, and Pacific Rail Road (station shown on left); and three blocks to the east, with streets and building sites, laid out. He recognized the need for housing and services for those who would work at the fort, but did not live on the fort grounds. He called it Sheridan, after the very popular Phil Sheridan. The street names were interesting, Brady Ave (now Mansfield Ave); other streets were John, Elston, Joseph, and Howard. The military had brought the first settlement to the west edge of the soon to be Town of Sheridan. Denver, Clear Creek & Western railroad, a subsidiary of Denver and Rio Grande, completed the Fort Logan Branch from Military Junction (Santa Fe and Oxford) to Fort Logan on June 27, 1889, and merged into the Denver and Rio Grande August 12, 1889. Now there were two trains serving not only the military but the citizens in that area. On January 14, 1890, Peter Magnes, Peter McCourt, and Jacob Puff petitioned for incorporation of the "Town of Sheridan". The election on February 18, 1890, was approved by the court on April 14, 1890. In 1890 Denver, South Park, and Pacific railroad laid tracks on the west side of the Platte River through Bailey to South Park. Fort Logan Homes plat was recorded on February 27,1891 (at the northeast corner of Federal and Oxford); it was probably served by the Fort Logan Branch of the Denver, Clear Creek and Western railroad. Later all this land became the Englewood Speedway. 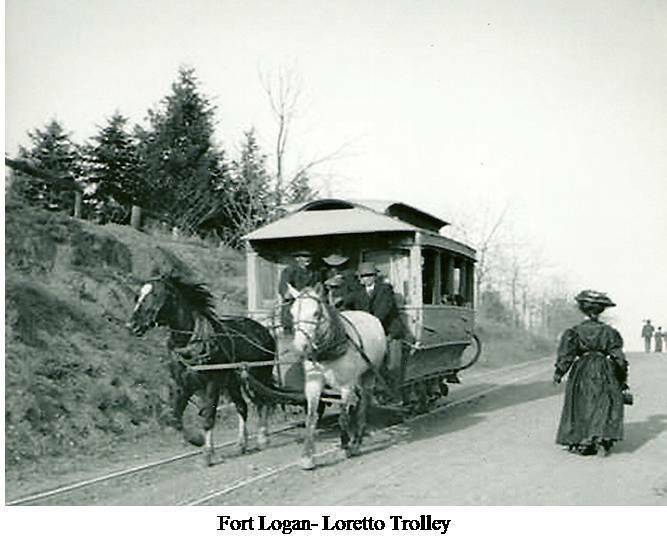 The Fort Logan Street Railway was initiated in 1897, by the Rev. Thomas Malone, Charles M. Ford, Thomas J. Carlin, Mary E. Bindewald, and Mary C. Walsh. The company was incorporated July 22, 1897, for $15,000.00. The plans were to establish a horse car service, and, if successful, electricity would be the motive power. Power lines would be leased. The line would run from the Broadway terminus to Loretto Heights Academy, a distance of some two miles. In August it was referred to committee, and the franchise would be granted if the company would agree to the conditions of the Commissioners. One of them is that the road, which would be a single line, should be built near one side of the road, and should not interfere with the grove near the river west of Petersburg, and that it should be bonded for only its actual cost. After such a struggle to get it authorized, the line finally went into business, running from Orchard Place (Englewood) to serve Loretto Heights Academy and Fort Logan. Because they were not allowed to cross the Denver, Rio Grande lines along Santa Fe, riders had to get off the Railcar, cross the tracks on foot, while the driver unhitched the horses and led them across, hitching them to a car on the other side, the passengers re-boarded and off they went. An article in the Arapahoe Herald, February 26, 1958, quotes 'No man's Land at Hampden, Scene of Fight 60 Years Ago'. The article reported that the Englewood City Manager, Leslie R. Rudd, and City Engineer, Neil Barde, announced that the strip of land 25 feet wide and 200 feet long was thought to have been within the boundaries of Englewood, but discovered it was not. A strip of land was involved in a fight between the Loretto Heights Street Railway Co, headed by Father T. M. Malone, and the D&RG and Santa Fe railways. The LHSP Co, which was a horse car line, had built south from Loretto Heights Academy, on Federal Blvd., to W. Hampden, and then east to Santa Fe Dr. Also it had built from Orchard Place (now Englewood) to the railroad tracks. The franchise was built in 1898 and ran for a couple of years, when it was abandoned. The rails were torn up and the franchise covered the use of the ground in question. Records were lost when the present Arapahoe County was created in 1902. At the numerous urgings of the cities of Englewood and Sheridan, the Englewood Depot was built by the Atchison, Topeka, and Santa Fe Railways Company in 1915, replacing a small wood frame open air building used as the train station since 1898. It opened for business June 1, 1915. 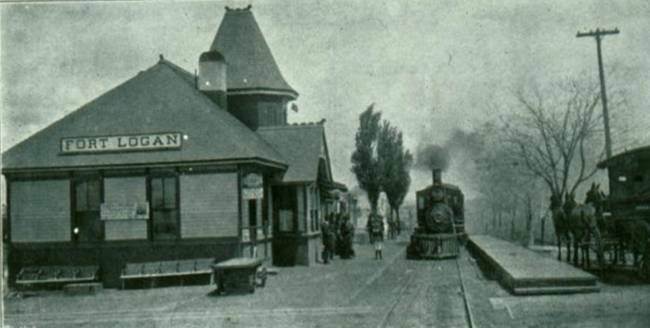 The Depot was built on the same property the earlier station occupied. The land was donated by Peter Magnes in 1890 for the D&RGW to build the earlier station. Although the Depot was named Englewood by the AT&SF as the official stop, the building was actually in Sheridan Town limits. There was not a common rail use agreement between the railroads serving the Depot. To accommodate both a separate set of tracks for each line had to be provided. This was an important depot for the citizens, merchants, and military. It ceased operations in the late 1970s. In 1993 the Depot was scheduled for demolition to make way for the Light Rail project from Denver to the Littleton and south suburban area. Due to the interest of Englewood Citizens and cooperation of the City of Sheridan, the station was moved on September 19, 1994, to its present location at South Galapago and West Dartmouth Avenue into the city of Englewood. 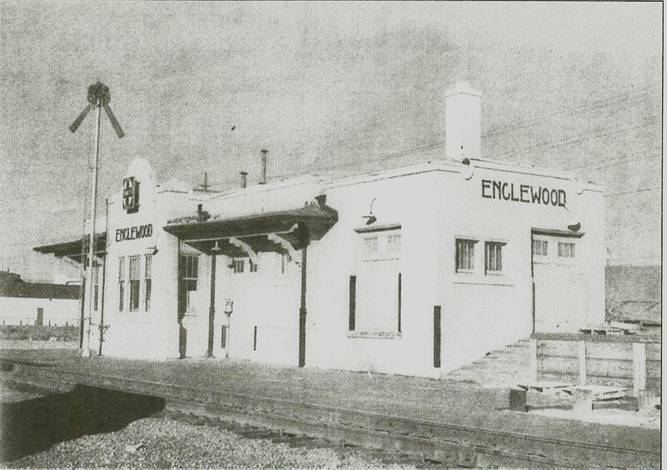 On November 9, 1994, the State of Colorado [now Colorado History] designated the Englewood Depot as a State Historical Building. The building holds the Smithsonian Number 5AH.778 (Site #2-1994). Because of the tonnage commitment by both cities, the Englewood Depot was built with a baggage and freight annex complete with a high capacity scale and a 125 foot long wooden plank loading dock serviced by a dedicated track and switching abilities. The mission style building is only one of two remaining and it is important to remember the history of the communities, the service to the communities, the military and the postal service, but to upgrade and restore it for a public use. In an excerpt from letter to Trevor Stover, from John Freeman about the first truck in Logantown. 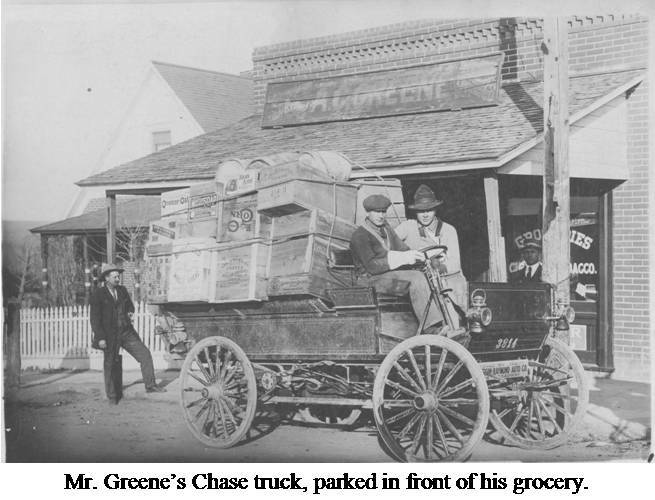 He writes that he remembers "the first horseless carriage vehicle in town' a small Chase truck. The one he refers to belonged to Mr. Green[e] of Grocery fame. He and Ernie Hoffmaster were coming from swimming in Bear Creek and were walking up the main road when they heard a noise and looked over their shoulder 'to spot this horseless contraption coming up the road toward us. We jumped aside and when the vehicle came astride us it stopped and the driver Mr. Green shouted above the noise of the engine 'hop in boys and I'll give you a ride up to the store.' That thing was a strange monster and we hesitated, but with a little assurance that it wouldn't blow up, we climbed in back in the bed of the new truck. That was the first Auto ride either of us experienced." Automobiles required the development of adequate roadways, and the citizens clamored for public transportation. Oxford and Hampden [formerly Sheridan Avenue] were paved with concrete, an unheard of concept, by the military in 1931. A private bus company was formed, connecting both the cities of Littleton and Englewood. In 1946 the military post Fort Logan was declared surplus property and was divided among local entities. This resulted in the loss of two railroad spur lines, which had served the fort. Denver, South Park, and Pacific quit claim their lines, the station building near Kenyon at Lowell was burned as a practice burn by the Sheridan Fire Department. The Denver and Rio Grande, still serving businesses from Santa Fe to Federal, quit claim their rail lines from there to Lowell. In the flood of 1965 the rail lines, which were on the south of the bridge over the Platte River went out and took the city bridge with it, but it still services from Santa Fe to the river today. We take a moment to reflect on information of the past from tidbits gleaned from The Denver Post Column "On This Date" by Stan Oliner about the railroads and other interesting facts. "In 1893 a Post article had lavish praise for the Colorado exhibit at the World's Columbian Exposition. Specimens of mineral ores and crystal formations from the State were shown." It went on the say, "Yesterday's shopping: The May Shoe and Clothing Co. would pay shoppers the cost of any train ticket on the Denver & Rio Grande, Santa Fe or Midland railroads. Just show your return ticket." "In 1893, Rio Grande railroad officials proposed to reduce conductor's salaries as a strike was promised by the workers." "In 1894, businessmen were watching the fight over the naming of a receiver for the South Park Railroad." "In 1895, the second Alpine Tour over the South Park railroad was proclaimed a success by tourists who said they were thrilled by the ride through the Alpine Tunnel." "1917 Yesterday's shopping: Roundtrip on the Santa Fe Railroad from Denver to Chicago $46.50, $55.00 to Detroit. Colorado & Southern trains would take you to Cheyenne Frontier Days for $3.25 round trip, Telephone Main 805." "1918 The Denver & South Platte Railroad sought to increase fares from Englewood to Littleton from five to ten cents. A receiver was appointed for the Denver & Interurban Railroad Co., which operated an electric line between Denver and Boulder as well as the street railway at Fort Collins." "1943 Special authority to reinstate trains between Pueblo and Glenwood Springs was granted to the Denver & Rio Grande Western Railroad to handle the rush of military furlough and holiday traffic. Moviegoers were enjoying Tyrone Powers.